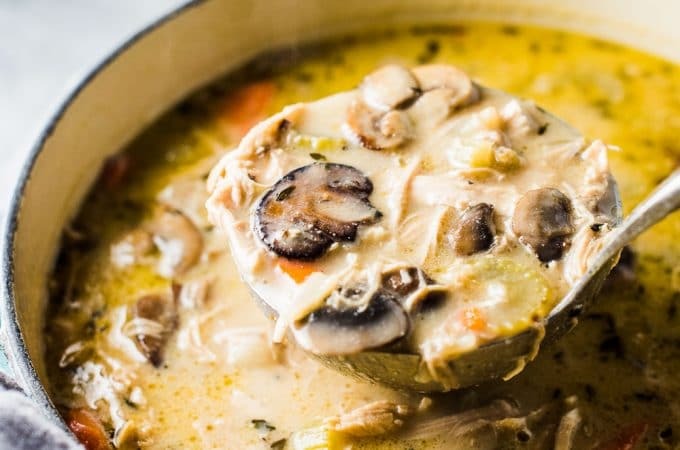 This creamy Turkey Mushroom Soup recipe is crazy delicious. By making a few simple changes to a classic recipe, it becomes super healthy even though you would never know it. It's naturally gluten-free + paleo + Whole30 approved. It's a great way to use up your Christmas or Thanksgiving turkey leftovers! Happy Thanksgiving! I hope everyone has bellies full of turkey and mashed potatoes and every side there has ever been. Mmm mmm. Truth … I celebrated Thanksgiving back in October cause that's the way we roll here in Canada. I'm feeling a little jealous right now the all my American friends get to be waist deep in turkey sandwiches. If you're feeling a little overwhelmed with leftovers, I've got just the thing for you. 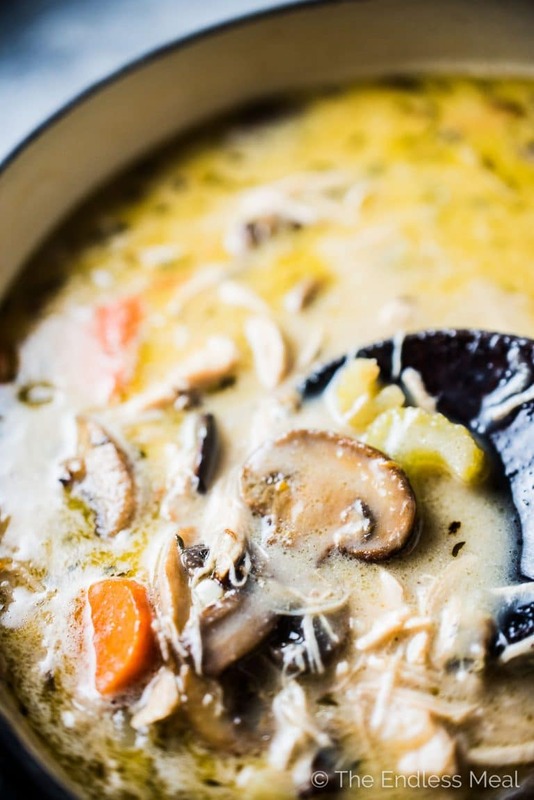 It's called Creamy Turkey Mushroom Soup AND this one is as healthy as it gets. ? Not even joking. The creaminess comes from blending both a potato and some cashews (or cashew butter) into the soup. 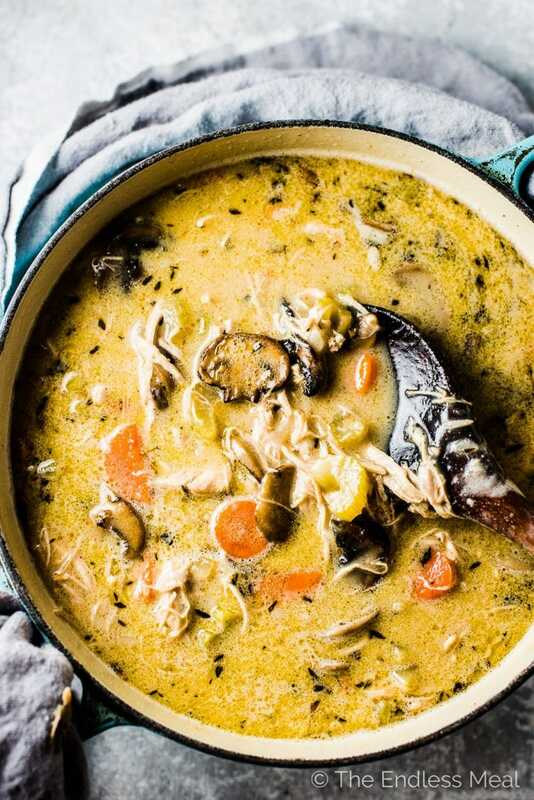 The result is a creamy turkey mushroom soup that tastes like you poured a cup of cream into the pot. It's amazing. 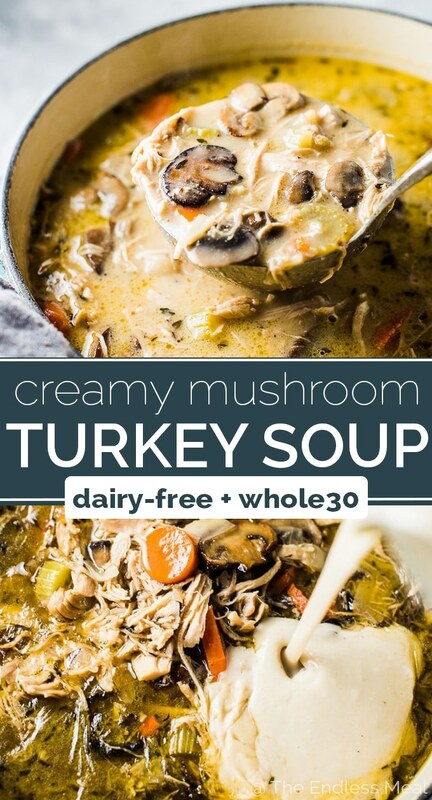 What makes this the best creamy turkey mushroom soup? If I say, “Everything” will you run to the kitchen to make it? Ok ok, that wouldn't be fair, even if it is true. → The ‘Cream' – Did you see it pouring into the pot up there, looking a heck of a lot like whipping cream? It's a total impersonator. What you're looking at is a potato (that was cooked in the soup), a handful of cashews, and some of the turkey stock. It has a richness so much like cream that I doubt anyone you serve this to would ever guess it's dairy-free. → The turkey stock. Not going to lie, homemade stock is where it's at. Since it involves no more than putting bones in a pot, covering them with water, and letting them simmer a while, it's not something you need to be afraid to make. I like to use my Crock Pot Turkey Stock recipe. When I'm cleaning up from Thanksgiving dinner, I pop all the turkey bones into my crock pot, fill it with water, and set it for 10 hours. When I wake up the next morning, I have a pot of the most delicious stock. It's ridiculously easy! → The mushrooms. I LOVE mushrooms! Are you with me? If you're not, you could leave them out. The mushroom part of the Creamy Turkey Mushroom Soup wouldn't make much sense though. My Easy Homemade Turkey Soup recipe, the one I've been making since I was about 20 years old, and the recipe my mom gave me, doesn't have mushrooms in it. 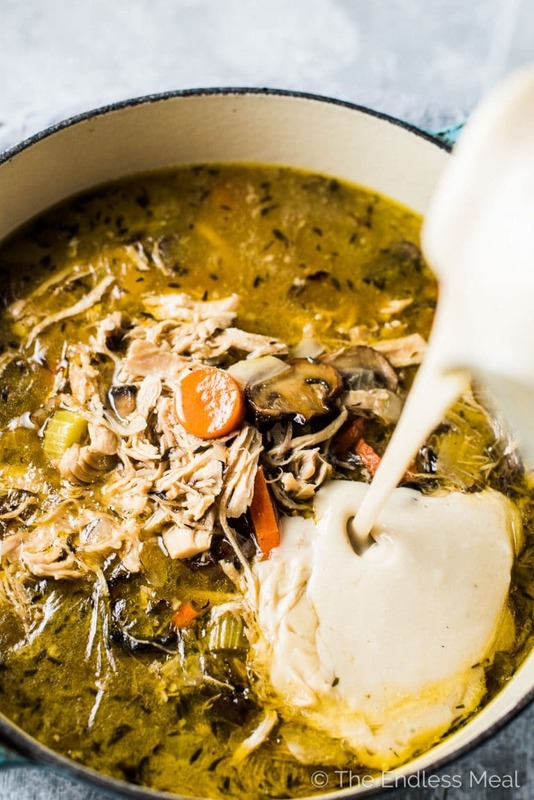 I never thought I'd find another turkey soup recipe I liked more, but it looks like that day has come. Give it up for mushrooms! → The everything. Yes, this is a real thing. There's just something about how all the ingredients, as simple and few as they are, come together to make something so much more than themselves. This is warm you up and make you happy kind of soup. → Easy easy easy. Yes, this is also a thing. The soup is so easy to make that it's extra amazing that it tastes so good. Saute veggies, simmer with the stock and turkey, blend some cashews and the cooked potato, EAT. See what I mean by easy? → It's versatile. I know this is the day after Thanksgiving, but you can make this all year long but using chicken instead. I've done it. It's amazing. Just make sure you're making the stock just like you do with the original turkey version. 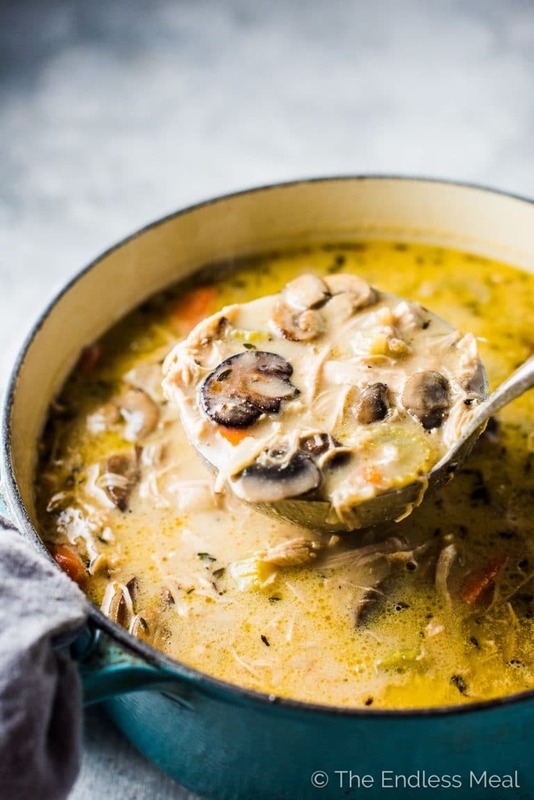 This creamy Mushroom Turkey Soup recipe is crazy delicious. By making a few simple changes to a classic recipe, it becomes super healthy even though you would never know it. It's naturally gluten-free + paleo + Whole30 approved. It's a great way to use up your Thanksgiving or Christmas turkey leftovers! Note: this recipe uses the leftover meat from your turkey dinner and stock made from the bones. You need to make the stock first – it's easy! This is the crock pot turkey stock recipe I use after ever Thanksgiving or Christmas dinner. You can also make a stovetop version using this recipe. Heat the oil in a large pot over medium-high heat. Add the mushrooms and cook until they are soft and starting to brown, about 10 minutes. Add the onion and cook until it softens, about 3-4 minutes. Add the garlic and cook for 1 minute more. Add the carrots, celery, potato, thyme, turkey stock and meat to the pot and bring to a boil. Reduce to heat to medium and simmer the soup for 20 minutes, or until the potato is soft. Remove the two potato halves from the soup and put them in your blender. Add the cashews and enough of the soup liquid so they will blend. Don't worry if you get a few small pieces of the other veggies into your blender. Blend on high until smooth then return the ‘cream' to the pot. Season to taste with sea salt and black pepper. Cashews blend best in a high-powered blender. If you have a regular blender, it is best to use store-bought cashew butter or raw almond butter. You may also use regular dairy cream instead of the cashews. Just made this soup exactly as written. I used my homemade turkey bone broth that simmered in my crock pot for 24 hours. Super delicious and easy to make. Will make it again….Was going to post a pic but I don’t see where to attach photos. I wish I could see the pic! If you still have it, you can tag @theendlessmeal on Instagram so I can see it there! I have made this four times! It has easily become my favorite soup. the only modification I made was ti skip the celery and double, sometimes triple the mushrooms! 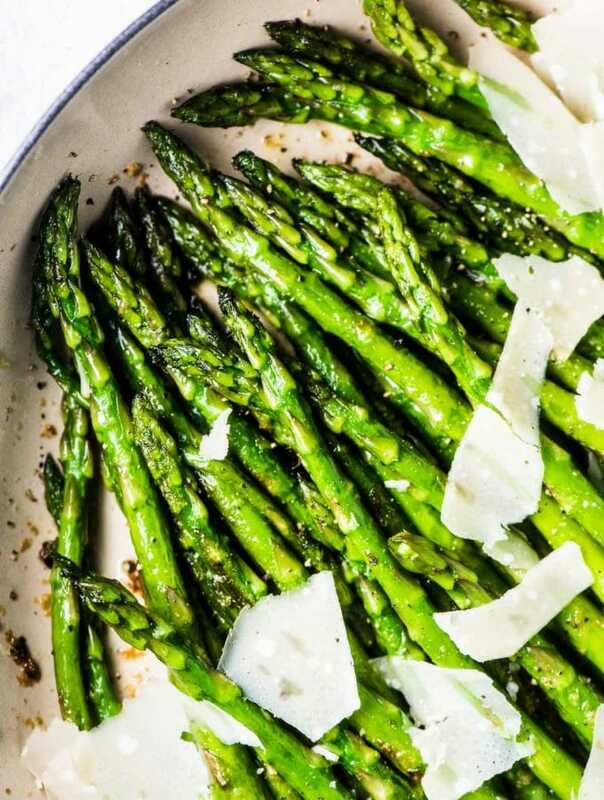 So satisfying and my W30 go-to comfort food! Excellent soup! Thank you! Got a turkey on special after Christmas. Cut it up and froze the parts, then made broth from the carcass and froze it. I kept thinking I’d have leftover meat when I used one of the parts but I never did so I bought some skinless boneless thighs, cut them in small pieces and cooked them with the veggies in the soup. Even my picky teen likes it! Thanks! This looks absolutely delicious! I plan on making it tonight. I’m going to be the only one eating this and needed to know if this will freeze well? If I am using cashew butter are the measurements the same. Can I use ground turkey in this? It looks so goood! If I’m making this ahead and reheating, should I wait to add the cashew cream until reheating? Or just make full recipe, and then reheat? Thanks for the tasty recipe– looking forward to making it! Made this today and it was fabulous! Thank you for sharing the recipe. This sounds amazing!! I bet adding frozen peas last 10 minutes would be good too! Just can’t wait! I wonder if using left over mashed potatoes with cashews could be used in place of the potato? I think peas would be a great addition! And yes, mashed potatoes would totally work! Tonight I made this with 1/2 cup cream (omitted potato and cashews) and it was absolutely incredible! Made the broth and soup using my leftover Thanksgiving turkey and it is heavenly. Wish I had more leftovers!! Thanks for this amazing recipe! This was SO good. Bravo on a delish recipe, I love the creaminess! I made this in my instant pot, put it on the Soup “Low” mode for 20 mins and it turned out almost perfect! Maybe would do a bit less than 20 mins next time. Thank you for letting us know it can be made in an Instant Pot!!! I made this yesterday with chicken and it was amazing! Will be my go to recipe from now on. Hooray! It’s one of my favs too!! 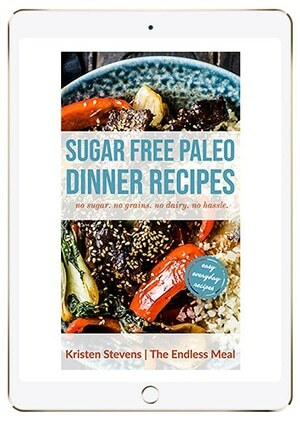 This is going in my regular Whole30 rotation! In fact plan to eat it Whole30 or not. And I’m making it for an upcoming party. I’m so happy you like it! It’s one of my fav recipes!! 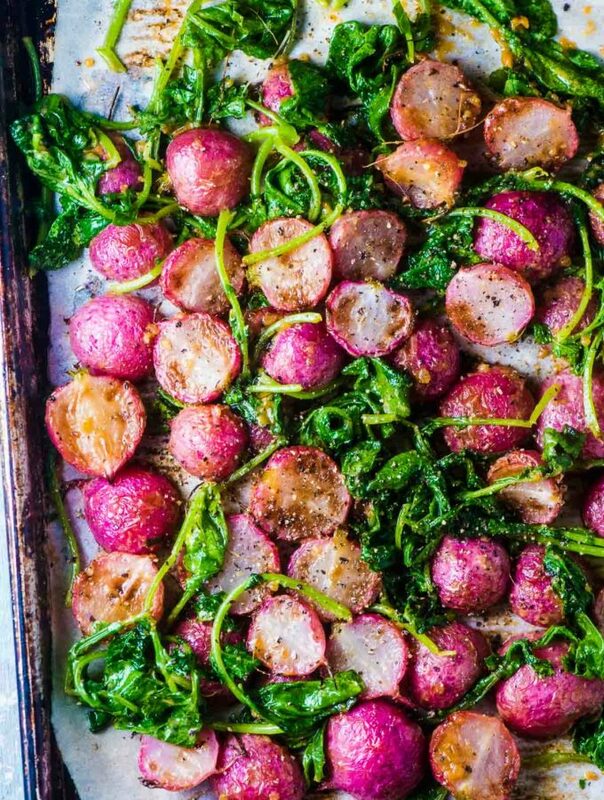 Is this whole30 if you use a potato? I thought only sweet potatoes were allowed on whole30? This was seriously amazing! I was shocked at how beautifully the potato/cashew combination thickened – actually silkened – the soup. It was beautiful. And so very tasty. My turkey stock was particularly rich and flavorful this year, and the mushrooms added their own wonderful flavor. This will be a regular in the winter rotation from now on! I made it today with homemake turket broth and half&half instead of cashews. It turned out very good. Made this yesterday and today! My first time making stock, and making homemade soup. Fantastic, too easy to be real, and I’ll most certainly make it again. My soup ALMOST looked like your pictures, but it seems like your soup had some oil to it. Neither here nor there, I loved it and so did my dinner guests! I am dying to try this recipe!! Do you happen to have an instant pot version? How much cashew butter to use in place of the cashews? I don’t have a high powered blender. But, I have soaked cashews in water overnight, and then blended them, and it works great! The cashew water is then useful too! Can’t wait to try this soup recipe! Thanks! That’s so great to know! I wasn’t sure if they would have a gritty texture or not and I don’t have a regular blender to test. Thank you so much for letting me know!